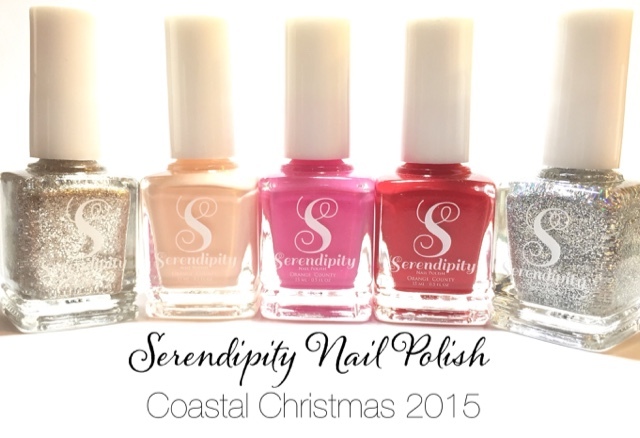 Yesterday I started to post swatches for the Serendipity Coastal Christmas and I am just loving them! 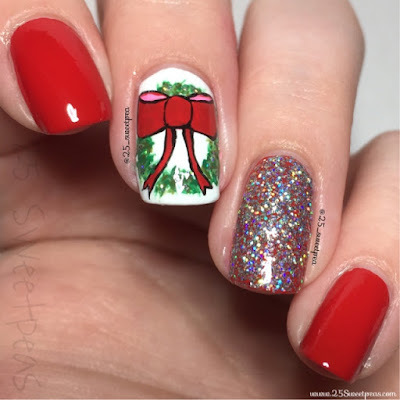 The colors all see to go so well and I am loving all of the polishes! If you missed yesterday's you can see Peace, Love & Sandy Feet HERE. :) I really loved it plus the art was so much fun! So be sure to pop over there and check it out! Today I am sharing Big Red Bow which is just lovely! 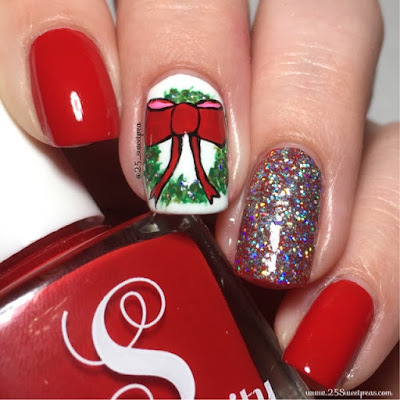 Big Red Bow is a one coater and wow, I am so impressed! 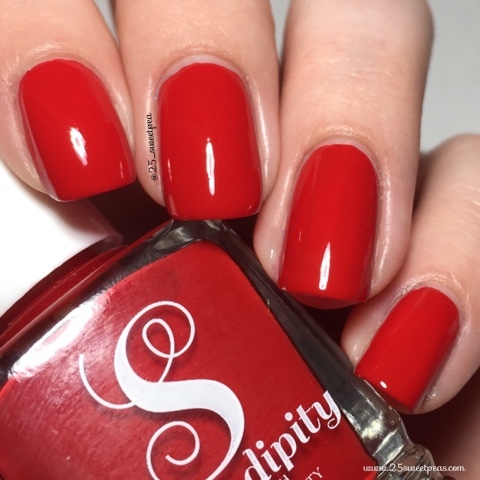 The formula was so so nice easy to use and I mean really you can't beat a nice red one coater! It does dry shiny alone but it's topped with the Serendipity Finishing Touch which just made it extra shiny and complete! Now with a name of Big Red Bow it only seemed fitting to do a big red bow so that is what I did! Plus I added Holo-day as a topper to have a fun accent! Also I used a tiny dotter and added it to the wreath as well for a little extra pizzazz. ;) The wreath was done in acrylic paint and the white base is Zoya Snow White. 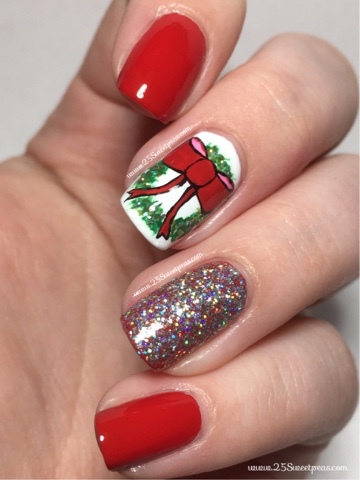 I am having way to much fun with Christmas manis! Literally!!! ;) I will admit it was very mentally hard to take off the palm trees from yesterday! I think those maybe a top favorite over all from everything I have EVER done! It really has that big of an impact! Well I hope you all liked these as much as I do! 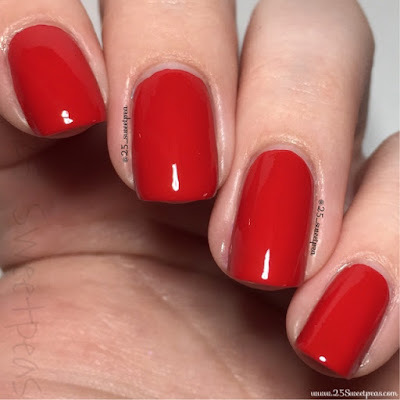 They are so much fun, plus over all I am just in love with this red!